A beautiful action was organized by German organizations “Johanniter” and “Antena Bayern” for Moldova. 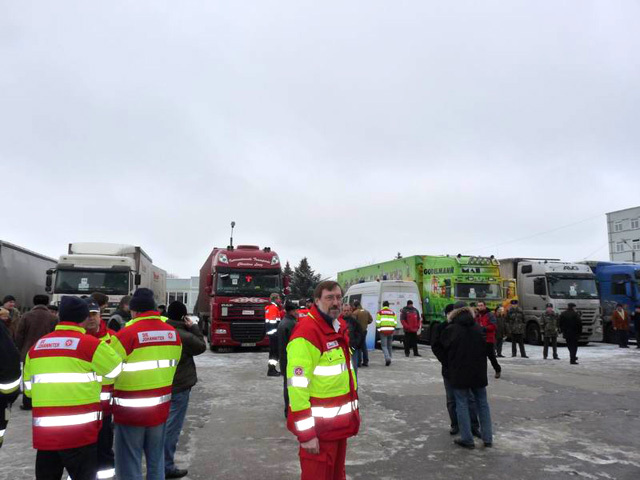 13 trucks arrived from Bayern, Germany to Moldova in order to distribute Christmas packages with food products and sweets to our deprived people. Only PRO UMANITAS received around 5 tones of Christmas gifts, which were immediately shared out to our Day Care Centers BUNVOLENTIA, to the Day Care Centre for Elderly and to our social soup kitchen, where more than 120 persons are daily fed. 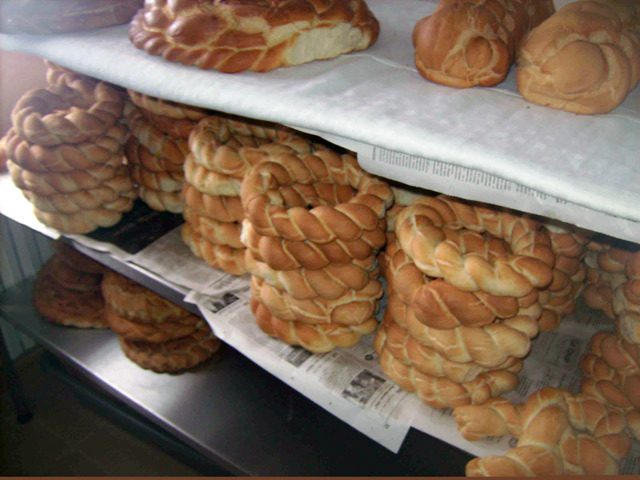 A real happiness fort he whole Ochiul Alb village – after several years of problems and difficulties with lack of bread in Ochiul Alb village as well as in the next villages, are these finally solved: the first bread batch was baked in the own bakery of the village yesterday. Ochiul Alb will be supplied with fresh bred every day now. Blessed Christmas feast and a peaceful year 2009 wish the whole PRO UMANITAS-team to all web visitors. It already became a wonderful tradition among our children to make small presents and surprises for other children. So, the children from Day Care Centre “Saint Maria”, Grigorauca organized a concert for children from the rehabilitation centre, Singerei. Lively dances and beautiful songs resounded for these children on Christmas. At the end of celebration they received small presents. On 18 December 2008 there was organized the annual meeting with the founders of PRO UMANITAS. During the meeting there were discussed the results of our activity in 2008 and the future plans for 2009. During 2008 year the Hanz family from Switzerland provided financial support to 15 disadvantaged families from Grigorauca village. As Christmas comes soon, this action was very helpful for the families because they could solve in this way urgent problems. At the moment some from these families have financial sources for buying heating means (wood and coal) for winter, medicine and winter clothes. The Italian organization "Seborga nel Mondo Onlus" works for more years in Moldova. The volunteers from this organisation gather and deliver the gifts to the disadvantaged children from the entire world. The organization is active more at south of Moldova. But this year the children from our projects were also involved in this action. 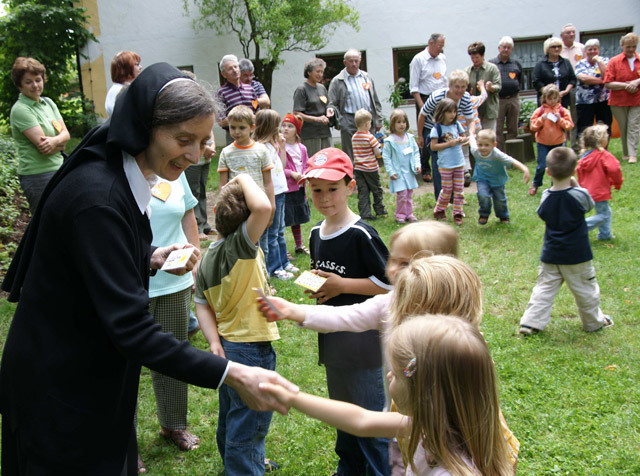 Already during more years Sister Rosina organizes different actions together with the children from the kindergarten St. Michael, Schierling. G. The gained money from this event Sister Rosina sends to Moldova. Due to such activities 458 children from Trasnistria, Moldova during 2008 received Christmas gifts. In order to express their gratitude and happiness the children from Transnistria send their drawing and handworks to Germany. The president of Swiss organization “Help for Children in Need” (HCN), Mr. Peter Garst visited our country together with his wife, Mrs. Martha, in order to examine the new projects. It was his 13th trip since 2004. They visited all Day Care Centers for Children with the president of PRO UMANITAS and two collaborators. These 11 centers are financed by his organization. 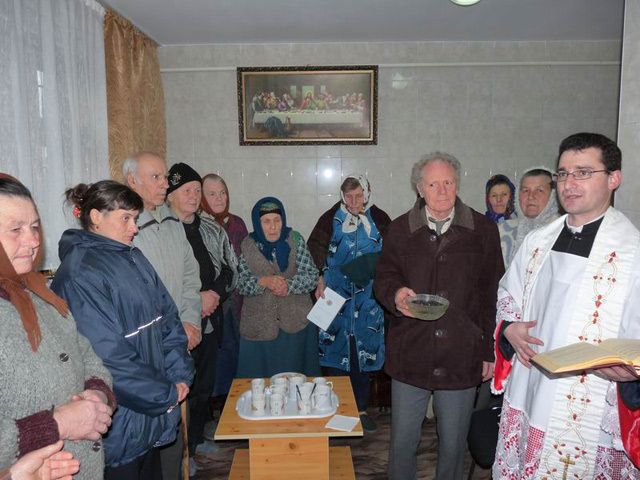 A special event was waiting for them – blessing of the Day care Centre for Elderly “Sfintul Petru” in Grigorauca village. HCN finances the current costs of the centre alongside with the local soup kitchen for about 130 persons. The Day Care Centre for Elderly “Sfintul Petru” was opened in Grigorauca village. The idea of opening of this centre came from the priest of the local Romano-Catholic church Daniel Medves, who already has similar experience in working with old people. The project runs under the direct supervision and participation of priest Daniel from October 2008. The German organization “Schmitz-Hille-Stiftung” financed the equipment of the centre. The Swiss organization “Help for Children in Need” finances the current costs of the centre. The project offers to 16 old and lonely people meal, hygienic and medicine care, clothes wash, discussion and occupation. 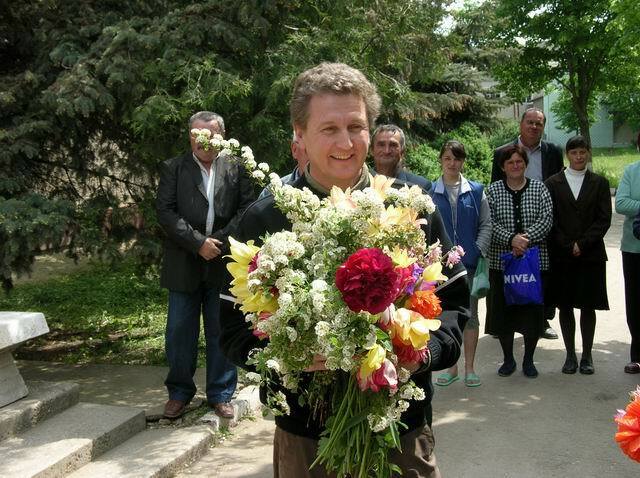 The executive director of German organization “PRO Moldavia e.V.”, Priest Clemens Bombeck visited our country once again. Priest Clemens visited our projects in Ochiul Alb and Grigorauca villages, to which implementation he contributed, as well as the PU-office. At the same time he gathered information for his next report about the situation in Moldova. Priest Clemens thinks about the possibility of new projects implementation in our country. Family Schmacks from Nettetal, Germany visited a poor family from Grigorauca village, Moldova in August 2008. The poor living standards of the deprived family impressed Mr. and Mrs. Schmacks. After their visit they decided to accomplish some repair works in that family’s house. The workers are ready to begin with the repair works. It became a Moldovan tradition to celebrate the Worker’s Day from the field of social security at the end of September. The Department for Social Security of Child and Family organized this event on republican level. Our Children’s Home of Familial Type and Day Care Centre for Children BUNVOLENTIA – Cojusna received a diploma for professionalism and outstanding results. The price was awarded by the Minister for Social Security of Child and Family, Mrs. Galina Balmos. 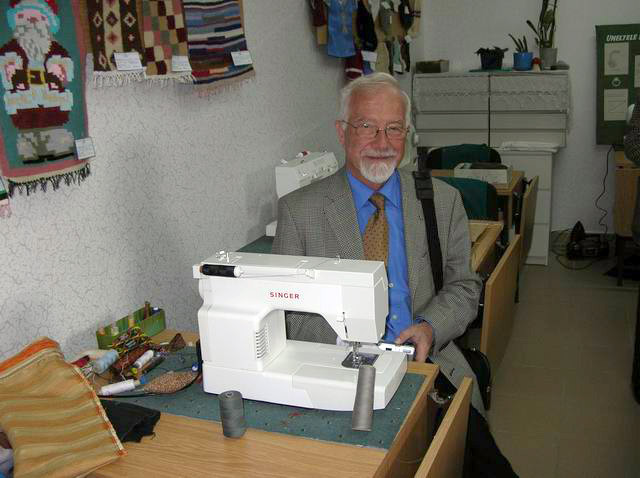 By order of „Help for Children in Need“ P. Erwin Benz was in Moldova from September 29 till October 3. He was initiated by ophthalmologist Dr. Tatiana Girdirimschi into the planned centre with outpatient department for blind children and children with sight injures; she also showed him the kindergarten for blind children and children with sight injures from Chisinau. – In Ochiul Alb village some questions regarding the bakery that is found in its implementations stage were clarified. – Further the cloth delivery for PRO UMANITAS and ORA was discussed. P. Erwin Benz established that the work done is efficient. People of Ochiul Alb village, district Drochia are waiting for a wonderful event: the opening of a bakery, which will provide the villagers with fresh bread. There was never a bakery in Ochiul Alb village. The 3300 villagers had always to deal with the problem of insufficient bread, especially in winter. In case of snow, they can stay without bread for several days. In addition, new work places are offered. At the same time, courses for baker education will be organized, since there are so many young people from deprived families that would like to embrace this profession. The renovation of the building and the equipment of the bakery are financed by the German organization „Schmitz-Hille-Stiftung“ and by the Swiss company BLIDOR AG. A wonderful present for children with slight mental handicap from the boarding school in Calarasi: with the beginning of the new school year children study under a newly renovated roof. The partial roof repair of the school building was possible due to the financial support of mayor's office of Bühl partner town, Germany. The president of German organization „Freunde von Moldawien“, Mrs. Regina Weiss visited our country together with 5 representatives of the same organization. They visited our Day Care Centre for Children “Saint Maria” in Grigorauca village. Since some of our guests were in Moldova for the first time, they visited some families from Grigorauca and Petropavlovca villages, in order to create an impression about the living standards of villagers. The possibility of realization of a new project was discussed. Republic of Moldova faces with the problem of inundations at the moment. As a result of heavy rainfall during July, many regions close to the river valleys of Nistru and Prut, the biggest rivers of Moldova, were inundated. Many people were affected by these circumstances: 1371 children were evacuated from the summer camp in Vadul lui Voda, a village close to Nistru. About 300 houses were destroyed and about 500 houses need a general renovation. Consequently, we received many calls for help from the flood victims. A marvelous gesture of the inhabitants of Schierling, Germany. People of Schierling organized a neighborhood feast of Uhland Street in order to raise founds for deprived children of Moldova. 600 EUR were raised. The official money donation took place on July 21, 2008. 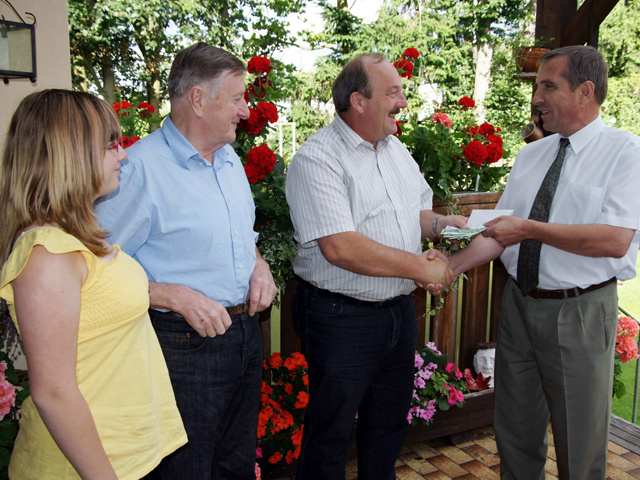 Silvia Pietkevicz, Ludwig Grauschopf and Walter Pindl donated the raised money personal to Vladimir Nadkrenitschnii, the President of PRO UMANITAS, who went on business trip to Schierling. Priest Hans Bock from Regensburg and Mr. Garst, the President of Swiss organization “Help for Children in Need” took part at this event too. Our 7 orphan children from Children’s House of Familial Type BUNVOLENTIA – Cojusna will go to the sea in Odessa, Ukraine in August. It is a real pleasure for children, since they never saw the sea. All costs are taken upon Mrs. Ludmila Tranga. Mrs. Tranga lives in Cojusna next to our Children’s House of Familial Type and had already given toys and other things to our children. The president of Swiss organization “Help for Children in Need”, Mr. Peter Garst made his twelfth trip to Moldova. The goal of the trip was to watch Day Care Centers’ development as well as to visit the new Centers. Mr. Garst was impressed by projects’ results. At the end of his visit, the president of HCN held a discussion with PU-collaborators about the present and future projects. Day Care Centre for Children „Saint Maria“ is finished!!! Children from Grigorauca and Petropavlovca villages have a delightful event – the repair works of the new building for the Day Care Centre “Saint Maria” are finished. 5 well equipped rooms are at about 120 deprived children’s disposal. Children already visit the new centre with great pleasure. Thanks to the action “Every kilometer counts…” organized by the city hall of Bühl, Germany, donations for roof’ repair of the boarding school in Calarasi were raised. The cyclists rode 2200 km in order to improve the living standards for children. A meeting with the representatives of Bühl city took place in the boarding school in Calarasi on Saturday, 12.07.2008. Within this meeting the decision of roof’ repair was made. The lack of a fence in the boarding school for children with slight mental handicap in Straseni was a big problem for a long time. The boarding school is situated in a forest and near a main road, that is why children were exposed to many dangers. Thank to German organization „Menschen helfen e.V”, which financed the reconstruction of the fence, children can be protectec fron these dangers. Bühl city organized a very special long-distance cycle tour / Bühl, GER – Calarasi MD /. This cycle tour that realizes under the logo “Every kilometer counts…” will raise donations for the boarding school for children with slight mental handicap in Calarasi. With raised money next project within the boarding school in Calarasi will be accomplished together with PRO UMANITAS. The second big project of PRO UMANITAS within the boarding school for children with slight mental handicap in Calarasi was finished: All windows and doors of the bedroom building were newly installed thanks to the German organization „KINDERMISSIONSWERK“. Children will feel good in a bedroom building with new roof, windows and doors. Many children involved in our projects Day Care Centers have no possibility to have a rest in summer. Thanks to the financial support of the Swiss organization “Help for Children in Need” and the German organization „Schmitz-Hille-Stiftung“, 358 children will have real summer vacation. Summer camps will be organized for children from our Day Care Centers. 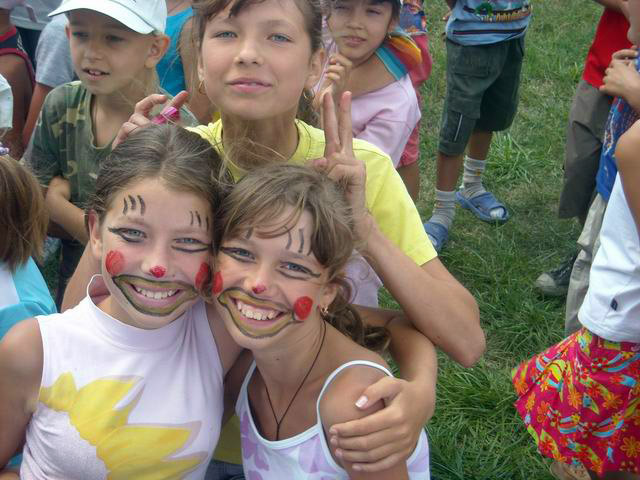 A summer camp includes trips, visits to sights and historical places of Moldova, free time occupations, such as painting, games, dance, reading et al. The roof of the bedroom building from the boarding school for children with light mental handicap in Calarasi was in a bad condition. During rainfall, interior walls and ceilings of the rooms were always wet. Thanks to the German organization KINDERMISSIONSWERK it was possible to begin with the repair works of the roof. The construction firm carried out the repair works in a short time. Children have warm and dry rooms now. Old people from Moldova are often alone and helpless. In order to try changing these circumstances in their little villages, children from the Day Care Centers BUNVOLENTIA – Alexandrovca, Gangura, Misovca decided to offer their help in household (cleaning, work in the yard and garden) to the old people during the summer time. The Child’s Day is celebrated on June 1. Our little ones enjoy this special holiday. Children from our Day Care Centers prepare themselves for this unique day with great pleasure and delight. Children from the Day Care Centre “Heilige Maria” in Grigorauca plan to organize a little concert for children from Mihailovca village and other neighboring villages. Other BUNVOLENTIA – Day Care Centers will prepare e special program for children too. At request of KINDERMISSIONSWERK, Germany the journalist / photographer Rolf Bauerdick came to Moldova, in order to visit the projects that KINDERMISSIONSWERK had financed, as well as the new projects that the organization is financing. Mr. Bauerdick was very impressed by these projects. The member of the board of Südzucker AG, Dr. Thomas Kirchberg and Mrs. Kirchberg, the management board speaker of Südzucker Moldova SA, Dr. Alexander Koss and the expert in agricultural development of Südzucker AG, Dr. Bernd Kästner and Mrs. Kästner visited different project segments in the auxiliary boarding school Calarasi on May 21, 2008. They were impressed by these projects, to which accomplishment they financially contributed. At the end of the visit the guests distributed presents to children. Another project financed by Solon Foundation is the project supporting the students from deprived families. Mr. Funk from the Solon Foundation is convinced that education of the young generation offers to it more opportunities for further development. Thus, the Foundation supports the university education of 32 deprived students from different regions of Moldova. Mr. Funk met all students financed by Solon Foundation on May 16; he also visited some of the students’ families, in order to create an impression about their living standards. Finally drinkable water for the population of Grigorauca village! Our little country had the honor to greet a special guest from the far Canada. Mr. Douglas Funk, the representative of Solon Foundation visited Moldova for the first time, in order to observe the development of Foundation’s projects. One of these projects had the improvement of sanitary and hygienic conditions of the village as major goal. The official opening of the project took place on May 15, 2008 in Grigorauca. Mr. Funk was received warm-hearted from the population and with great respect. The villagers have flowing water of the best quality now. Mr. Dr.-Ing. Dipl.-Math. tech. Robert Roithmeier, president of the organization „Menschen helfen e.V.“ and Mr. Ingo Ingerl, member of the named organization visited Moldova again. They stopped over to see their projects within the boarding school in Straseni as well as other PU-projects. Our guests were very impressed with the projects’ development and made plans for some future projects. 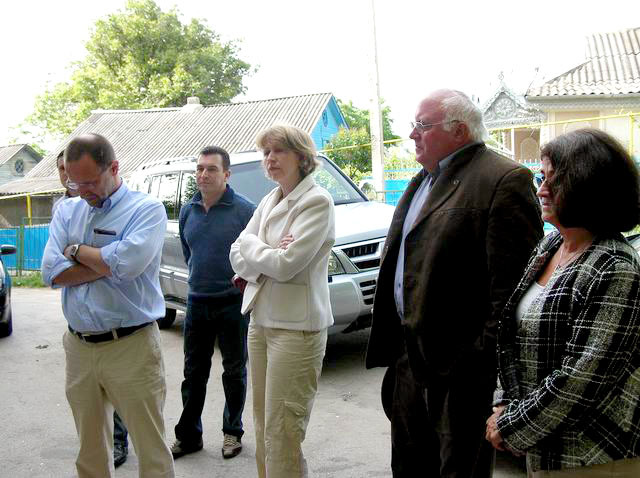 Between 20.04 and 23.04.2008 Mrs. Ursula Honeck, the president of the organization „Hilfe für Osteuropa e.V.“, visited Moldova together with Mr. Gunther Köllner. There are 15 years of friendship, partnership and productive collaboration with de German organization; during these years many people in need received support. Mrs. Honeck visited the PU-office. She also met representatives from different hospitals from Moldova, because she is preparing a new humanitarian transport for our country. In the first days of the new year, Anna Kirsten, Sophie Holländer, Inga Kosbab and Lina Steinbach together with many children from the der Herz-Jesu-Gemeinde in Gladbeck (Germany) were by rain and shine on way. 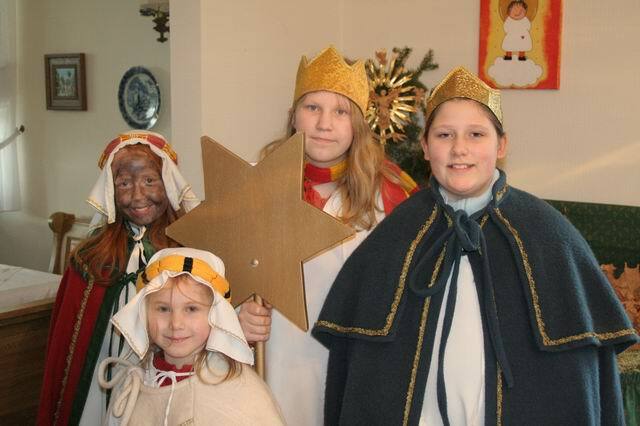 They and many other children and teenagers of the Gladbecker Gemeinden went to people’s doors in order to bring the message of Christmas and to proclaim God’s blessing for the new year. Within this action, the „Sternsinger“ collected money – according to the slogan „Children help children in the whole world“. Anna, Sophie, Inga, Lina and many other Gladbecker Sternsinger collected donations for the project „Day Care Centre for Children“ in Grigorauca this year. The personal warm-hearted sympathy and energetic solidarity encourage our Austrian partner to visit Moldova. 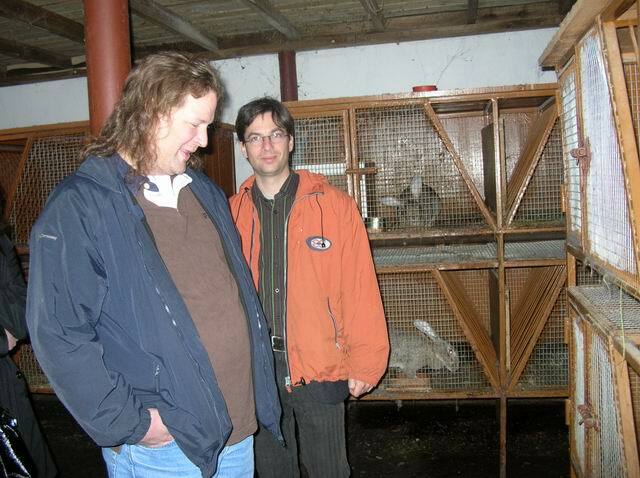 During the period of April 11, 2008 and April 17, 2008, Dr. Gottrfried Prenner, Osteuropahilfe, Mrs. Heidi Flammer form Franziskusgemeinschaft, Mr. Josef Krutzler, Selbstbesteuerunggruppe, and other guests visited our country, in order to help our people in need. They were in Chisinau and Transnistria, where our spiritual leader Pater Pjotr met them. Our guests visited the PU-projects and made plans for the future. 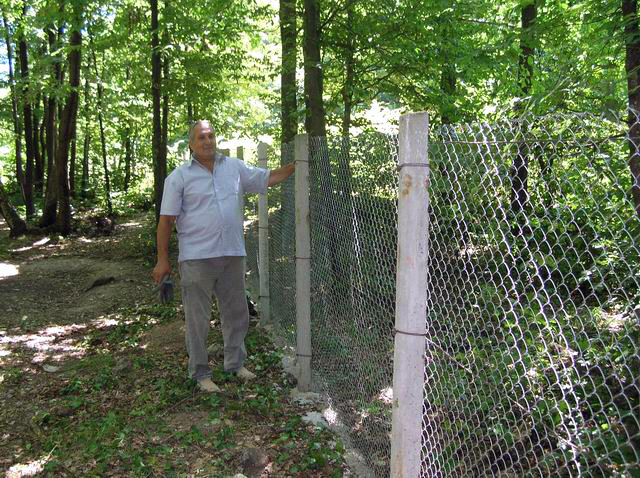 The project Water supply for Grigorauca village is finished. According to the project, a well of 90 m deep was drilled, a tank tower (50 m³) was installed and a water supply system was partially changed. The villagers drink water of good quality now. The project is financed by the organization Solon-Foundation, Mr. Doug Funk. 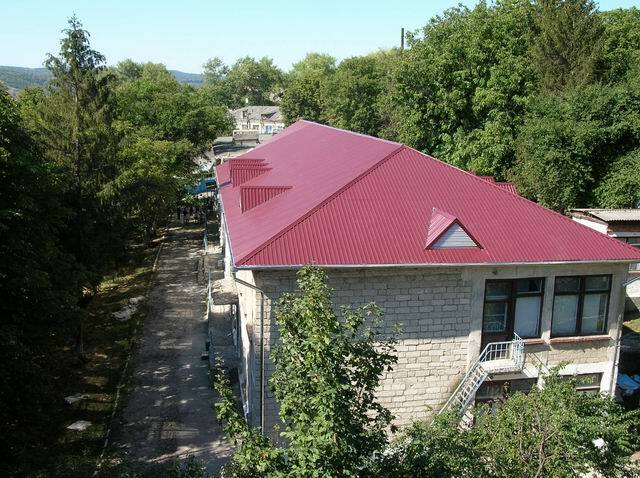 The repair works of the new building for the Day Care Centre for Children in Grigorauca village have already begun in March 2008. The building was offered to us by the city hall for free. The President of the District Council Singerei visited our project. He was very impressed by everything what our partners do for the Moldovan children. The children of Grigorauca village will be able to fulfill their daily activities in a new building soon. During March 15 and 20, 2008 Mr. Ralf Kresal, the executive director of the Schmitz-Hille-Stiftung, Germany visited our country. The goal of his visit was to see the progress of different projects developed in Moldova, including those of PRO UMANITAS: The buildings for the Day Centre for Children and the Day Centre for Old People in Grigorauca. It was a successful and productive visit with positive results. Moldova received guests once more. 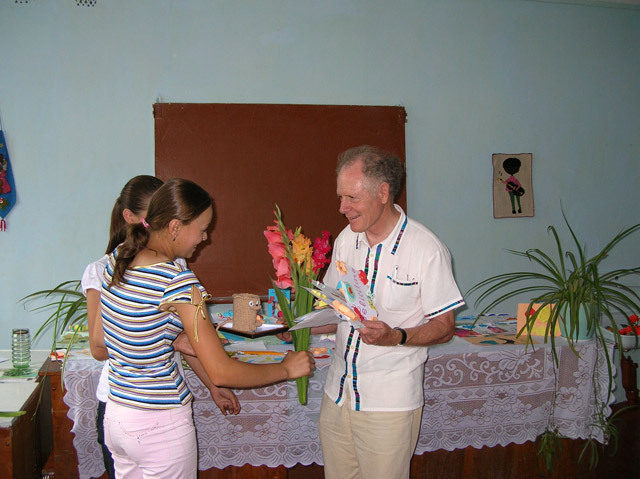 Between March 16 and 22, 2008 Mr. Manfred Ahlbrecht visited again our country. Mr. Ahlbrecht saw different projects in Straseni, Calarasi (the boarding school for children with slight disabilities), Grigorauca, and held various meetings, such as the meeting with KNAUF GIPS in Balti. During this meeting the supply of building material for the Day Centre for Children in Grigorauca was discussed. The essence of the visit of Peter Garst from the organization „Help for Children in Need“ and P. Erwin (March 5 – 10, 2008) was to see the Day Centers for Children settlements. Children’s and their parents’ contentment – as well as that of the authorities – are the best references. Especially positive is the connection of the Day Centers to the public school, to the church or to the local jurisdiction (city hall). The substantial and creative exposition as well as the stimulant and enriching interchange within a meeting of the responsible persons for the development of the Day Centers for Children amazes. – Further, Garst and Benz got in touch with the school for blind children in Balti as well as with Dr. Tatiana Ghidirmischi from the medical and social rehabilitation for visually impaired in Chisinau along with godparents and with persons, interested in our projects. A certain quantity of material and threads were given up for the sewing training in Straseni. A valuable and important document with the number 760 comes into view: The Department of Justice public recognition of PRO UMANITAS as a charity association of general utility. On February 16, 2008 the first seminar under the guidance of the Charity Association PRO UMANITAS was held. The topic of the seminar was “Experience interchange in the coordination of the Day Centers for Children BUNVOLENTIA. Prospects”. At the seminar took part the coordinators and teachers of the Day Centers for Children BUNVOLENTIA – Cojusna, Grigorauca, Petropavlovca, Mihailovca, Cozesti, Gangura, Misovca, Alexandrovca, Ochiul Alb. There were also present two teachers and the mayor of the Crasnoarmeisc village, where a potential Day Centre may be opend. The seminar offered to the coordinators and teachers the chance to share their professional and personal experience in children’s education one with another and to give an example to the new centers. During the seminar the children’s works were presented. Starting from today, 20 children from vulnerable families of the Cozesti village, district Singerei, have the possibility to go daily to the Day Centre, which is similar to other centers set up in different regions of the country. The Day Centre was opened thanks to the mayor of the village and the principle of the local school. The Swiss organization “Help for Children in Need” took upon itself all charges for the project implementation. The Grigorauca village has no water supply because of the damaged installations. The villagers drink water from wells. This water is of the worst quality, which is very dangerous for people’s health. Now the villagers have a motive for gladness: The work on the new water supply has already begun. The well drilling with a depth of 100 meter already started. Soon the villagers will have potable water. The project is financed by the Organization “Solon Foundation”. The Mihailovca village has a new reason for joy and happiness: A new Day Centre for deprived children was opened in the school building of the village. The centre is sponsored by the Swiss organization “Help for Children in Need”. At the official opening of the Day Centre took part the mayor of the community and the principal of the school. To another 20 children that visit the Day Centre after the lessons every day, was given a chance to develop their talent, abilities and aptitudes. A new Day Centre for deprived children was opened. The centre is sponsored by HILFSWERK Liechtenstein, President Beatrice Amann. The deprived children from Petropavlovca village go to the centre every day. The official opening of the Day Centre was held by Father Daniel and the mayor of the community. The children were very happy about this event, because the opening of the new center gives them the opportunity to receive a better education, to have the right occupation and to learn new things.